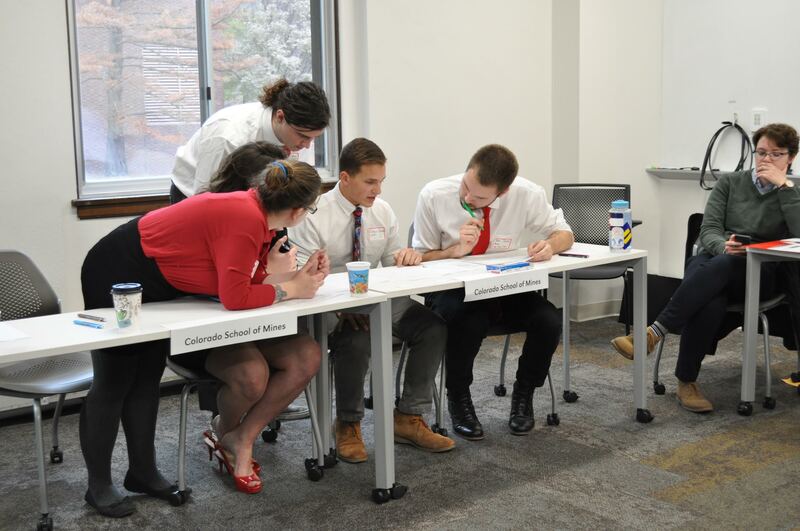 Students from Colorado School of Mines are going to the National Intercollegiate Ethics Bowl for the third year in a row. The Mines Ethics Bowl team beat out student groups from six other schools to win the Rocky Mountain Regional Ethics Bowl on Nov. 11 in Lincoln, Nebraska. Mines and the second-place team from Macalester College will move on to the national competition, set to coincide with the 2018 Association for Practical and Professional Ethics Annual Meeting in Chicago in March. Also competing in the Rocky Mountain Regional were Colorado State University, Metropolitan State University of Denver, University of Denver, University of Colorado Denver and Simpson College. Earlier this year, Mines placed in the top 20 at the 2017 nationals. The school began fielding Ethics Bowl teams four years ago. Making up the team headed to the 2018 nationals are: Meghan Anderson (electrical engineering); Parker Bolstad (environmental engineering); Amara Hazlewood (chemical engineering); Blake Jones (chemical engineering); Nia Watts (computer science); and Daisy White (geophysics). In Ethics Bowl, teams of three to five students face off to argue and defend moral assessments of the most complex ethical issues facing today’s society. Teams are judged on their ability to demonstrate understanding of the facts, articulate ethical principles, present an effective argument and respond effectively to challenges from the opposing team and judges. Around Labor Day, the teams received 15 cases, with brief narratives outlining some of the issues raised by each case. At regionals, 10 of those 15 cases were debated, but no team knew which would be chosen in advance. This year, the cases addressed in competition included the Dakota Access Pipeline, the U.S. Electoral College, the rise of fake news and the ethics of 13 Reasons, a TV show about teen suicide. The Mines team will get the cases for nationals in early January, giving them about three months to prepare their arguments, he said. “I’m excited to take what we learned last year and try to apply that and see if we can do a little better this year,” he said.